In 1967, Jim Purtell left his small Midwestern town to join the US Army. He did so at a time when the country was pro-Vietnam and serving seemed an honorable thing to do. Little did he know that the tide would turn a mere six months later as drastically as it did. 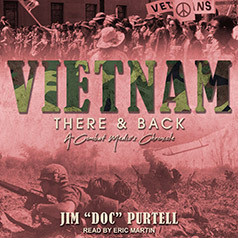 Vietnam—There & Back: A Combat Medic's Chronicle is a candid account of the time when he and several other combat vets found themselves conducting operations in the jungles of Vietnam during and after the Tet Offensive.